How to do Vastu Corrections to a Property | Vastu Remedy | Vastu Pariharam: As our Hermit sagely advice's (We thought so) may be not to provide any corrections, they informed how the Vastu Shastra is to be for happy living and live with peace. Respecting our Great Eremites we did not provide any Pariharam's so far, but very regularly we are getting the high volume of requests for the vastu remedies. Once after huge abundant demand, we decided to provide the Vastu Remedies online here. Please note that our Vastu remedies are not with images, the only text version is available, its only because of Fate rules which by respecting our Solitaires views. If there is compulsory to place the images, we will definitely provide them in this section. Honestly, we are esteem honor and regards to our Sage's views and their thoughts. These Vaasthu remedies may not be readily available as they are customized solution provided with the thorough understanding of Vaastu science. How troublesome was the life of residents, how to manage things with the help of Vaastu techniques. The experiences are published here with related information on vastu corrections. Only the reason that it was about respecting our Recluse and we did not developed this webpage. Otherwise, there are more than 25000 instances with us. From past many years, i.e., 2004 we are thinking about this page development, whether its good or bad, if there is no such strong reason, we are ready to provide more than 25000 instances at this page, which we come across from the year 1992. Someone suggested that vastu Remedy will be done without any demolition or renovate the structures, for example, demolition of walls, removing/altering doors etc. Is this system is possible in Indian Vastu Shastra? Why this word is so popular and it is observed that most of the residents are in search of those who can suggest Vasthu recommendations without demolition. According to Chinese Feng Shui, it is believed that reorganizing things in your home will get you expected results. Results vary from one individual to another. However, the current context is quite different to discuss on Feng Shui and its working strategies. Our website is only discussing on Indian Vastu Shastra and its strategies. 1. If there is a toilet or Staircase in the Northeast corner, there is no any other way except to remove these structures. Some people may suggest to retain the structure and place some items (generally which may be available in Feng Shui) to overcome the negativity. But very soon you may have to demolish the structure as the majority of the Vastu Consultants would recommend removing the structures, especially in cases like these. 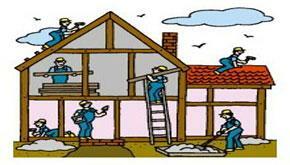 Thumb rule is to demolish any structure that obstructs the vastu compliance of a house. In exceptional cases, some solutions may be provided to balance the negative energies with some other techniques, we are also done corrections with mirrors in case when residents cannot remove the obstructions. But it should be only decided after visiting the property, through the phone call or email consultation the problem may not be solved. 2. If a house has a deep sump or well or Bore Well towards Southwest corner, then Vastu Specialist generally recommends to remove it or close it with stones, mud, etc. Alternate solutions such as covering the bore well with a lid etc, this small technique may or may not success. We recommend closing such structures on a permanent basis to avoid any ill-effects in the future. 3. If there is an extension towards Northwest-north in a property, it is better to demarcate that extension or implement other recommendations too such as closing the door for this extended portion or extending the Northeast corner to minimize the Northwest extension. Putting some idols may not bring any happiness in residents’ life. They may be temporary. If anybody come across with permanent results and continued more than two years, let us know such techniques, we will publish here for the society happiness. "Learning is a never ending process and we strongly believe in this. We are not masters of this science. We are students and learning things and learning things, it continued lifelong. We clearly know that God is the only master who can manage things permanently. In our journey to unleash the unknown facts of vastu shastra, we welcome all discoveries made by you to nullify the ill-effects of poor construction (non-vastu compliant). We cordially invite any proven techniques which you believe have worked beyond this science. We will take the honor of publishing such benevolent techniques and make our contribution to spread the word among human community. Our intention is to establish happy 'residential' environment globally to the extent possible. Our experience says - Nothing is fruitful except to follow the researchers and their experiences and principles. Very soon we will publish many vastu remedies in this section. Work is going on, Stay Tuned . . . .
What is Five Elements or Panchaboothas? What is Fate and its powers on human beings? What is street focus and its effects on properties? Which door is giving good results, which door is bad? Who is Vastu Purusha and What is Vastu Purusha Mandala? Buying home in Jor Bagh, who is the best vastu expert in Delhi? In which direction almirah should be placed as per vastu shastra? Can I buy the Northwest plot adjacent to my home, is it good to buy? Looking to buy new house, who is the best vastu consultant in Surat city? Is windows in our properties also plays any important role in Vastu Shastra? Whether the neighborhood is affected on our properties, is it in vastu shastra? Is dining room placement is good towards Southwest corner as per Vasthu Shastra? I am a small trader and doing share trading, can I get vastu help to earn more profits? In our own house there is rental house in ground floor. Now we alteredin that house privide one toilet at north east corner.can you give solution without demolishing vasthu correction. Dear Sir, We are having a pooja room in Northeast(over the porch) with a common wall having a bathroom. Below that bathroom is the kitchen. We ourselves are not happy with all this but due to current financial constraints can't dismantle anything right now. It's a house that was build up 17 years back by my father. Can you please suggest any Vastu remedy to overcome this vaastu defect and later on we can discontinue from using that bathroom and converting it to something else. Please advice. WE ARE STAYING IN PARENTS HOUSE SEPERATELY. I FLOOR MAIN DOOR NORTH WEST CORNER, BATH ROOM, TOILET CONSTRUCTED IN NORTH EAST CORNER(DEVA MOOLE) WITHOUT DEMOLITION HOW TO CORRECT THIS AREA. How to get vastu pariharam information. we are facing lots of problems in our house. I think we have to do some vastu corrections to this home. Respected Suresh Ji, I constructed my home in the year 2012, its facing is East. the water body well is towards Southwest, from the date of joining this home, we are all suffering with heavy health problems and financial losses. I am looking for the vastu remedies online. Can you please help me to come out of this bad situation. We done many pariharams, but could not come out of negativity. How to solve these problems. Dear Sir, My master bed room at Southwest got increased when we compared with NothWest room. However, overall plot is rectangle in shape and have sufficient space in east facing. Please suggest us is there anything can be done? We have placed gods photo frames on the Southeast and South west wall of the house. Kindly suggest if it is correct. Dear Suresh Ji, i have stairs in my home from north to south and curved in both clock (17 stairs) and anti-clockwise (14 stairs) from middle. let me know it is any harmful for my house prosperity and wealth. would like to know vastu remedy for this problem. Dear Sir, please guide about remedies available without construction change. What shall be done if there are vastu related problems but construction changes are not possible. The preset direction of my siting in the office is 290deg NW.What should be the right direction of sitting? Namaskar Sir,I recently buy ready-made house 2floors which have double height in east.Entry gate in corner of east and corner of north is missing due to boring there.NE block and SW also because of small land.Stairs in south and kitchen in SW.Now, realized that defects are lots in house and I'm scare a lots.House have directionless and vastu parush is like a butterfly. I heard that it is not good sign for living person.So, please kindly guide me ether sell it or is there any suggestion to correct this fault. This Modrem World where everything is soo much Commercial , I really made me so suprising and cannot stop to appriciate your help Guruji you have provided on call and Cretaing & maintaining such grt site will definetly take lot of Money and Effort which you are doing it for free for the benefit of people , keeing in view that people should not fall in wrong hands and waste there hard earned money. (1)we are having our MAIN GATE at the SOUTH EAST CORNER FACING EAST,LEFT SIDE OF THE MAIN GATE, ELECTRIC METER ROOM is made. CAN U SUGGEST ME THE CORRECTION TO AVOID THE NEGATIVE EFFECT WITHOUT DEMOLISHING THE STRUCTURES. Excellent web site you have done here.. It's difficult to find high-quality writing like yours these days.I honestly appreciate individuals like you! When ever we feel issues at our home, we generally visit your site and getting some hints to overtake those negative powers. Thanks a lot and Take care!! Namaste sir, I am looking for one vastu pariharam for the problem which I am facing in the home, joined in the year 2007. need your guidance to remove wrong placement of door. I am looking for simple vastu pariharam.